January – We had the large barns and farmhouse re-thatched (after 28 years). It took 6 men 10 weeks in total (and lots of tea and cakes!). February – We decorated all cottages, fitted some new carpets, installed some walk-in showers and revamped several kitchens. March – The pool complex was enhanced with a stretched ceiling and jacuzzi. April – A google visual tour was added to our website, click here to see the complex. June – We rehomed 3 funny Alpacas, Dorcus, Camilla & Betsy Buttercup. The children have had so much fun feeding them. 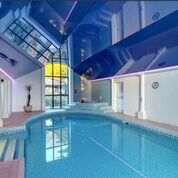 July – An Air Source Heat Pump was installed to heat the indoor pool (to a warm 29°) this will help save electricity and our planet. August – We raised £1071 for charity ‘Young Dorset’ by selling holidays in their yurt in our paddock. September – We incubated some eggs and raised 4 Aylesbury ducks (we used to live there). Feeding them on the pond has been fun for all. October – Holistic Massages were introduced to the delight of many guests. More beauty treatments will be introduced for the 2016 season. November – Improved WiFi, now superfast broadband is in Dorset. December – We were inspected by the AA and received a 4 star rating and are featured on their website. We very much hope we can welcome you to Berehayes this year. Bookings are already up on last year, so don’t wait too long if you wish to book! Check availability here. P.S. Did you know…….Berehayes Farmhouse was built in 1506, the same year that Christopher Columbus died.